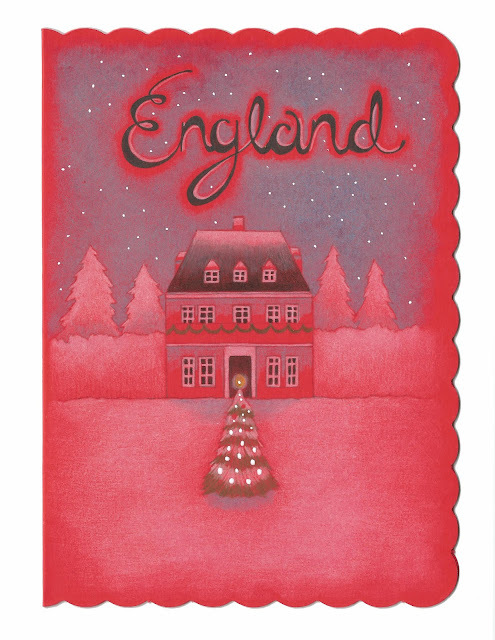 It seems likely that the husband and I will be spending Christmas in England this year. It will be our first real Christmas together and I imagine we will be spending it with his folks here in the UK (since I'm still waiting to hear about my visa status!). In honour of that fact I thought my second card design would feature my new home. I had no trouble whatsoever finding interesting facts about Christmas traditions here, in fact, most of them are pretty similar to how we celebrate back home. Just substitute Father Christmas for Santa Claus, a goose dinner for a turkey one, stockings hung with care on the ends of beds instead of on the fireplace. However, there were a few differences that caught my eye. Any Christmas celebration here is not complete without crackers. Not a salty, crisp bread product, but rather a party favour that is basically a paper tube, covered in foil and twisted at both ends. Each person crosses their arms and holds their cracker with the right hand and pops their neighbours cracker with their left and suddenly...POP! With a small bang the contents come spilling out, usually a joke, a paper crown and a trinket of some kind. I can remember seeing people in British movies always wearing these colourful paper crowns at Christmas and I remember finding it to be a fantastic and magical addition to the holiday celebration. I can assure you that I will be acquiring some crackers this year as I have already spotted them appearing in the local shops. Another tradition round here at Christmas is that of the mince pie. I admitted to my husband at the grocery store that I had heard of them (mostly in books), but I had never actually tried one. He then insisted that we have some and so, I can now say that I have crossed over into the delights of the mince pie. I will warn that they are a bit rich and very flavourful. I didn't take to them right away, as I don't tend to like things that have very intense flavours, but after having a couple with my tea they won me over. The foodstuff has a long history here in the UK. Knights during the crusades came home with their chain mail pockets stuffed full of spices, such as nutmeg, cinnamon and cloves from their travels. The original recipe called for a pastry filled with minced meat, suet and dried fruit, however during the Victorian age the pies shrank and dropped the meat, though the suet and fruit mixture is still called mincemeat for some reason, they were packed with spices and dusted with sugar and that's essentially what you will find today. If you're interested in learning how to British up your Christmas celebration this year I found a very helpful article.